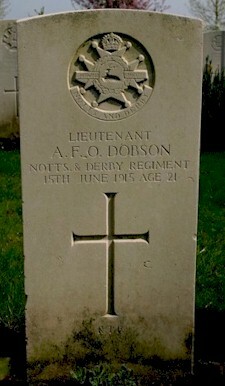 Alfred Frederick Otterbine Dobson was born in Nottingham on the 1st February 1894, the only child of Alfred Thomas Dobson and his late wife, Louise Lucille Dobson (née Merme)2. He lived with his father and step-mother at "Yew Tree Lodge", now the site of the Warden Aided flats and Social Complex in Union Street, Beeston, Notts. He was educated at Stonyhurst College which is located on the Stonyhurst Estate near Clithero in Lancashire. The famous author Sir Arthur Ignatius Conan Doyle, of the Sherlock Holmes detective books fame, also attended this Independent Roman Catholic School. During his time there, Alfred Dobson distinguished himself as an athlete and sportsman3. It appears that he joined the Army after leaving school. By 1913, as a 2nd Lieutenant, he was in joint command, with 2nd Lieutenant G Clarke, of F Company 2/8th Battalion Sherwood Foresters, based in Arnold, Notts, when a new drill hall was proposed there - and was opened in the following year4. By May 1915, he was with the 8th Battalion Sherwood Forester’s Regiment as a 2nd Lieutenant. On August 4th, the Battalion was in the Newark, Notts area with many of the new recruits coming from the outlying district. The battalion formed part of the Notts & Derby Brigade, the 5th, 6th, and 7th Sherwood Foresters, making up the rest of the brigade. The brigade was one of the 46th North Midland Division, the first all Territorial divisions to fight in the Great War. In early August the Brigade started their training in Harpenden and in November they continued their training near Braintree. It was while he was stationed in this area that the 2nd Lieutenant was promoted to the rank of Temporary Lieutenant in November 1914 and he was with the Battalion when it landed in France on the 12th May 1915. 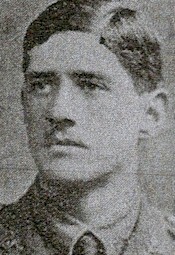 Previously a member of "D" Company of the 8th Battalion Sherwood Foresters, Lieutenant Dobson was put in command of the Battalion Machine Gun Section. Early in June the Brigade was in the West Flanders area around the village of Kemmel, some five miles South West of Ypres. At 21.00 hrs. on the 15th June 1915 the enemy exploded three mines under the trenches occupied by the 8th battalion causing many casualties. This took place as 7th Sherwood Foresters (Robin Hood’s) were relieving the 8th battalion. Precisely at this time the enemy, with artillery, trench mortar, rifle, grenade and machine gun fire, opened-up a terrific bombardment which lasted over an hour. Telephone wires were destroyed resulting in Battalion Headquarters being unable to communicate except by runner. With shells being in short supply allied artillery was virtually non-existent. The battalion machine guns occupied a position in the centre of a front line trench and took considerable enemy fire. It was during this action that a shell splinter seriously wounded Lt. Dobson. Meanwhile Lieutenant A.M. Williams commanding the Robin Hoods Machine Gun Section, was taking part in the relief of the 8th Battalion and went to the wounded officer's assistance. As he neared Lt. Dobson, another shell burst killing both men instantly. This was a great loss to both battalions, as both officers had trained their various sections to a very high standard of efficiency. Lt. Williams was the first officer from the 7th Battalion killed in action. After the relief the 8th Sherwood Foresters returned to billets in Locre. As well as the two officers mentioned, Lt. Hollis of "B" Company along with 60 other ranks of the brigade were casualties in this operation. The 6th Battalion King's Own Yorkshire Light Infantry, one of Kitchener's new army battalions, in the trenches for the first time, also lost several men whilst under instruction. 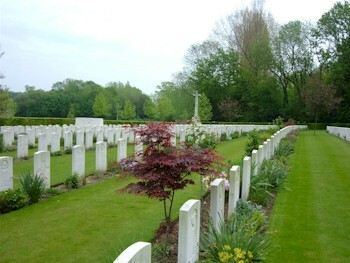 Kemmel Chateau Military Cemetery is located 8 kilometres south of Ypres on a road leading from Ypres to Kemmel.Kemmel Chateau was north-east of Kemmel village and the cemetery was established on the north side of the chateau grounds in December 1914. It continued to be used by divisions fighting on the southern sectors of the Belgian front until March 1918, when after fierce fighting involving both Commonwealth and French forces, the village and cemetery fell into German hands in late April. The cemetery was retaken later in the year, but in the interval it was badly shelled and the old chateau destroyed. There are now 1,135 Commonwealth burials of the First World War in the cemetery and 21 from the Second World War, all dating from the Allied withdrawal ahead of the German advance of May 19405. The image on the right shows Lieutenant Dobson's present memorial stone. Position your mouse over the image to show his original grave marker, as recorded by the Graves Registration Unit after the Armistice6. 2Alfred Thomas Dobson was a lace manufacturer (as was his father, William Ebenezer Dobson) who lived at 21 Lenton Road, in The Park, Nottingham, with the extended family, prior to his move to Beeston. He had married Louise Lucille Merme, born in Switzerland in about 1871, in Lancashire in 1891. Earlier in that year she had been working as a servant (possibly a Governess) in a doctor's household in East Barnet, Hertfordshire. She died towards the end of 1900 and Alfred married Augusta Martha Stevens towards the end of 1902.